This 3700 Series Hardtop Deluxe is certainly that! ****DELUXE**** Owned and cared for by a loving owner that has enjoyed her as a family Rotto boat with a fishing flare. Masses of deck space, designed for bluewater performance with a sprint speed of 32 knots and a economical cruse of 24 knots. Give us a call for a viewing! Just as at home cruising to the Abrolohos as sitting in a bay at Rotto. She has a nice saloon area with great vision all round, great functionality and solar shades for when its rest time. The extended rear awning houses the dinghy on a rack, a life raft and plenty or room for wave skis / surfboards etc. The large swim platform between the engines and deep fold down ladder rail makes light work of getting in and out of the water. The removable transom door is a good safety feature when out in the deep blue and opens up the transom nicely when needed. Living on board there is a functional galley with Microwave, stove, sink, fridge/freezer and heaps of cupboards. On the STBD side is a lounge for the family meals that converts to a second berth. Good seating for the journeys with 4 x forward facing seats and the big double bed forward looks very comfy. The bathroom to PORT is full height with a electric toilet to holding tank, shower and vanity. On the back deck there is a very functional storage and seat station in the centre and big under floor storage. There are 2 x electric WAECO fridges with cushions on top against the saloon bulkheads which would certainty be handy for extended fishing trips or a big week at Rotto. This boat represents great value for money at $165k. 500hp of 4 stroke power, and a rock solid boat. 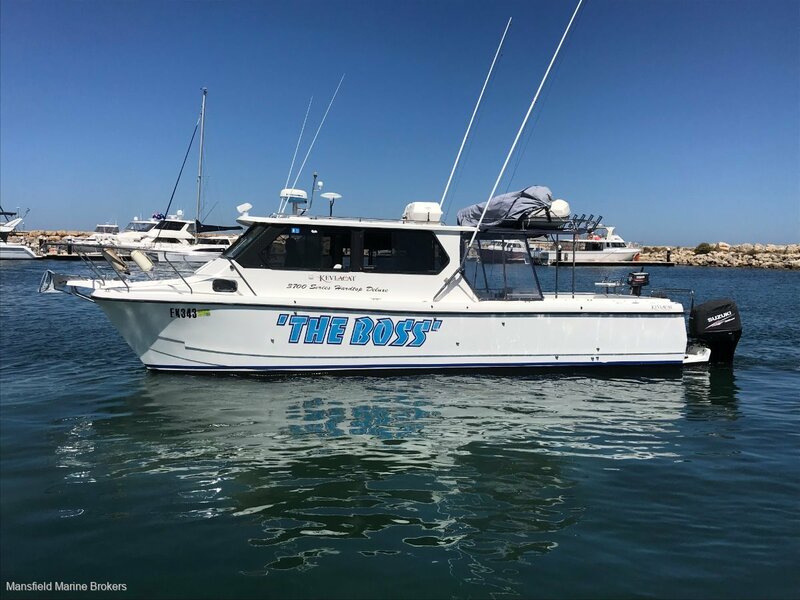 Contact Mansfield Marine Brokers, to arrange an inspection of this vessel which is located at Hillarys Marina in our display pens. LIFE CELL floating module with flares, Epirb etc. 2 x FURUNO MFD's with GPS, Sounder and Radar, Autopilot and remote control search light. Has to be seen. Good example of a legendary hull that is known around Australia for their COMMERCIAL ability and function.